"BAD TOYS, BAD TOYS, whatchugonna do? Whachugonna do when they come for YOU?" Join the only Small Police Officer as he cleans up the streets in this special episode! 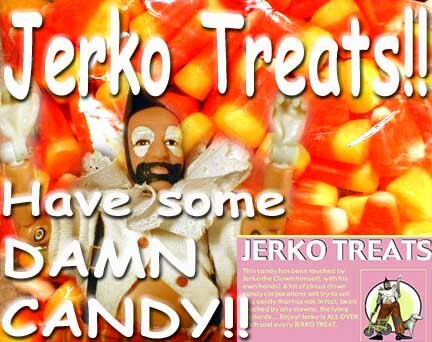 Brought to you tonight with limited commercial interruption thanks to a generous grant from The Committee to Re-Elect The Senator, and by JERKO TREATS: Every damn candy has been touched by a Clown! "Do you have anything pointed or dangerous in this pocket?"